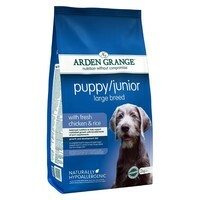 Arden Grange Large Breed Puppy/Junior Food (Rich in Chicken) is a complete and balanced diet that has been specially formulated to meet the nutritional needs of large and giant breed puppies from 2 months of age. Made with specific energy and fat levels to ensure a controlled and steady growth rate, use of this diet through the early stages of their life will help contribute towards their adult proportions, body shape and overall health. The larger kibble size of this Arden Grange diet is perfect for large and giant breeds, and can be fed dry or moistened depending on preference.